I’ve worked in the racing industry for a few years after leaving school and started a jockey apprenticeship, but quickly came to like the dairy industry and landed my first farming job in Apiti. 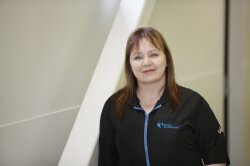 I started at Totally Vets way back in 2010 as a cleaner. 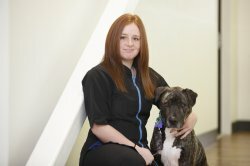 I slowly grew an interest in grooming department where I’ve worked alongside groomers here for more than 8 years and have recently stepped up to managing a small team of three other groomers. 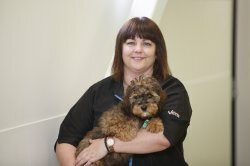 I started my grooming career in 2008 and joined the Totally Groomed team at Totally Vets in September 2017. 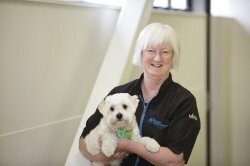 In 2017, I joined the New Zealand Dog Groomers Association, Since then I have attended regular workshops, and sat and passed 2 modules (Terrier & Gundog) towards my Master Groomers certification. I am happy to assist you with your dogs’ grooming needs, whatever that may entail for you. Aiming for a glowing clean healthy coat, styled to your dogs’ requirements. I have been grooming for 11 years and I am very passionate about my profession. I am currently working towards becoming Master Groomer certified, having gained breed standard certification in Terrier and Non-Sporting groups to date. I attend regular workshops run by the N.D.G.A.N.Z to keep my skills up to date in this fast-growing industry. I have been grooming at totally vets for nearly a year so far. I have been working and studying to hopefully get my master groomers certificate in the future. I have raced drag bikes in the past and own two motorcycles that I enjoy to ride when I get the chance. I also love my reptiles and own my very own bearded dragon named Toothless.